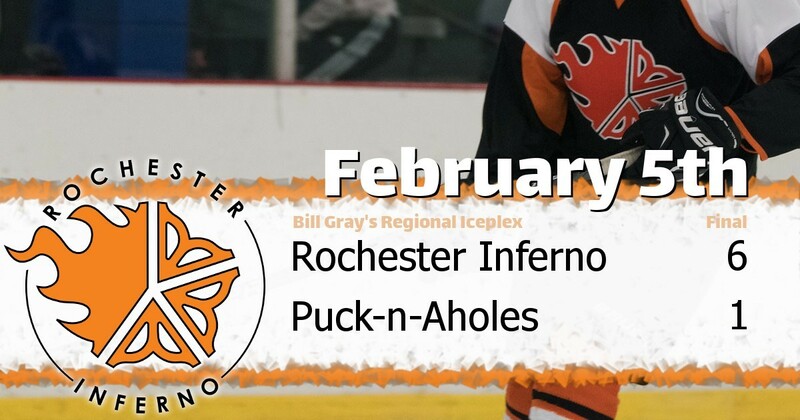 BILL GRAY'S REGIONAL ICEPLEX, February 5, 2019 - The visiting Rochester Inferno (Novice+) took on the Puck-n-Aholes in a matchup on Tuesday. The Inferno defeated the Aholes 6 to 1 at Bill Gray's Regional Iceplex. This was the 5th match-up between these two teams, and their last matchup was won by the Puck-n-Aholes 8-3. The Puck-n-Aholes lead the series 4-1-0. The Rochester Inferno had 9 players that made the scorecard. Josh Sydorowicz had 3 goals (3 points). Adam Keymel had 1 goal and 2 assists (3 points). Jason Baird had 3 assists (3 points). Doug Keller had 3 assists (3 points). Dave Morgan had 1 goal and 1 assist (2 points). Shane Bertou had 1 goal. Steve Sydorowicz had 1 assist. Chris Potter had 1 assist. Karyn Bower had 1 assist. Josh Sydorowicz was awarded the game puck.